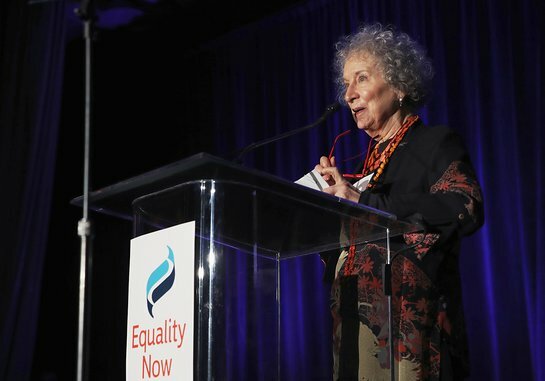 Leading women’s rights organization Equality Now honored author Margaret Atwood as a longtime icon and champion of women’s rights, as well as philanthropist and behavioral geneticist Sue Smalley, Ph.D. for her invaluable part in making gender equality a reality through her role on Equality Now’s Board of Directors, at their annual Make Equality Reality Gala in Los Angeles on Monday, December 3, at the Beverly Hilton. They also honored Amandla Stenberg with the inaugural Changemaker Award. The Changemaker Award, presented by Gucci and CHIME FOR CHANGE, celebrates the next generation of activists who are championing gender equality and inspiring positive change through self-expression and active citizenship. Comedian and actress Whitney Cummings served as the evening’s host. The evening also featured special performances by Demetri Martin, MILCK, and Linda Perry. Presenters included Goldie Hawn, Bruce Miller, Warren Littlefield, and Tracee Ellis Ross. Additional special guests included Justine Dorsey, Kerris Dorsey, Nisha Ganatra, Melanie Griffith, Norman Lear, Joy Lenz, Jane Levy, Laura Marano, Vanessa Marano, Matt McCoy, Donna Mills, Retta, Odeya Rush, and Nicole Smolen, and many others!